Please refer to our stock # TR566 when inquiring. 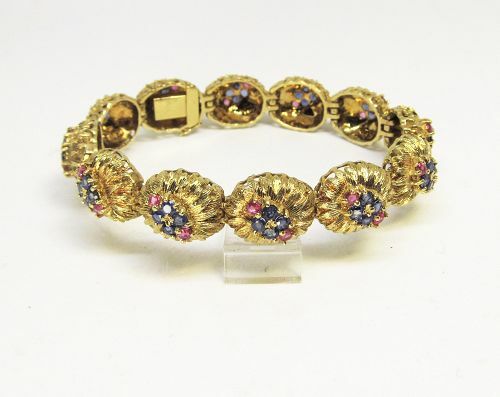 Attract the best kind of attention with this substantial 18 karat gold bracelet. The 12 links look like gold bird’s nests with 4 natural sapphires and 2 natural rubies in each one. The bracelet is 7 ¼ inches long. The closure is a hidden catch, enhanced with a figure eight safety. Dating from the 1960’s, this mod masterpiece is heavy on gold and long on charm.